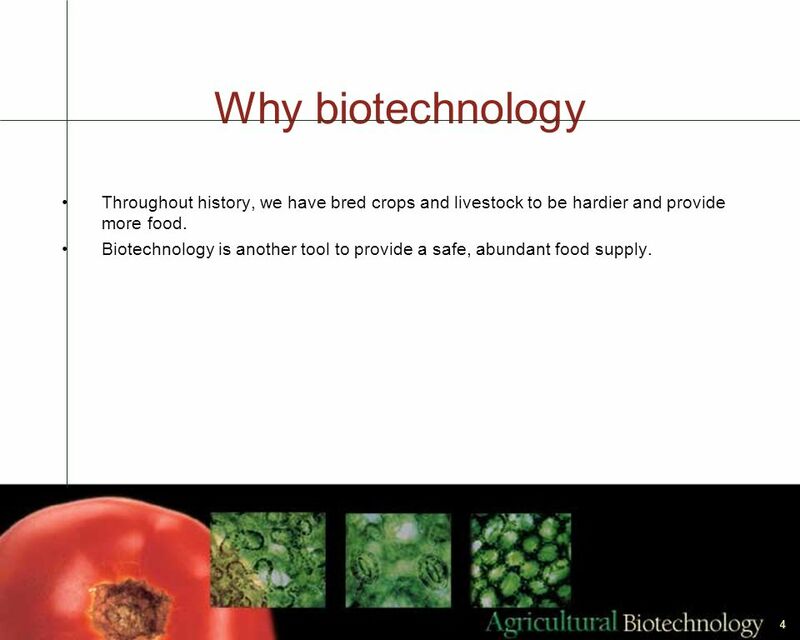 3 What is biotechnology? A collection of scientific techniques, including genetic engineering. Used to improve plants, animals and microorganisms. Can modify crops and livestock more precisely than traditional breeding methods. 4 Why biotechnology Throughout history, we have bred crops and livestock to be hardier and provide more food. 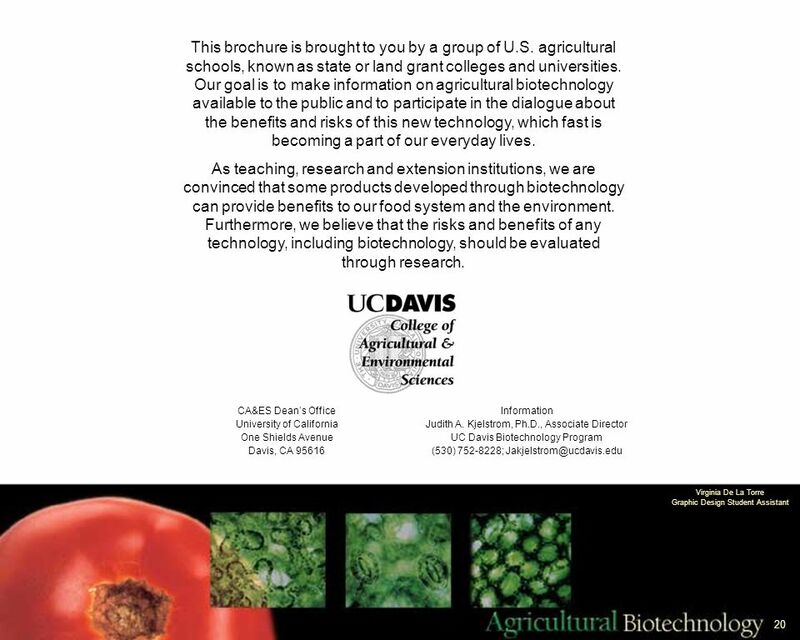 Biotechnology is another tool to provide a safe, abundant food supply. 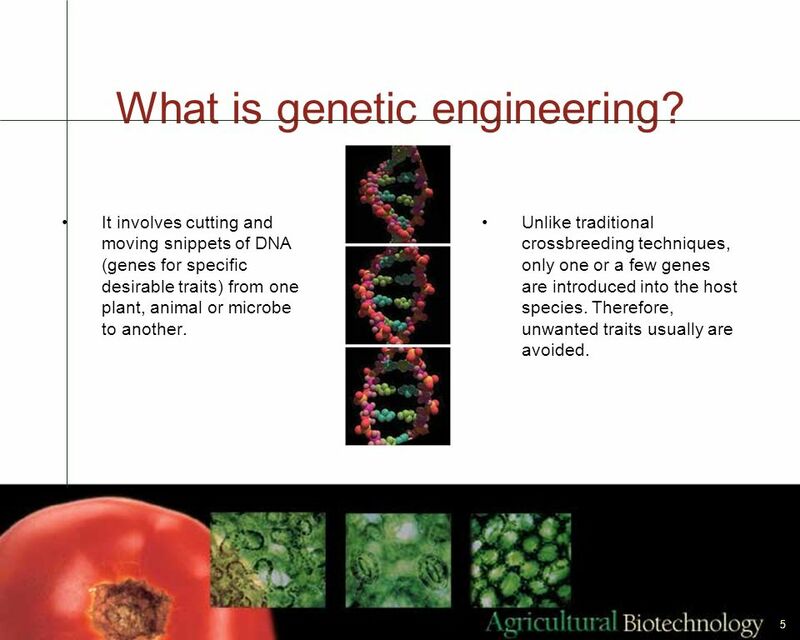 5 What is genetic engineering? It involves cutting and moving snippets of DNA (genes for specific desirable traits) from one plant, animal or microbe to another. Unlike traditional crossbreeding techniques, only one or a few genes are introduced into the host species. Therefore, unwanted traits usually are avoided. 6 When? Why? Who? 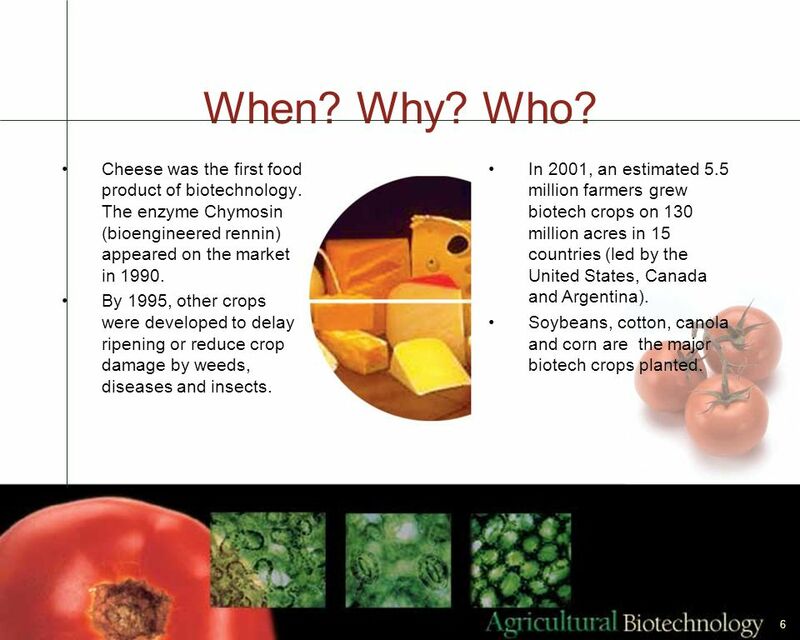 Cheese was the first food product of biotechnology. The enzyme Chymosin (bioengineered rennin) appeared on the market in 1990. By 1995, other crops were developed to delay ripening or reduce crop damage by weeds, diseases and insects. In 2001, an estimated 5.5 million farmers grew biotech crops on 130 million acres in 15 countries (led by the United States, Canada and Argentina). Soybeans, cotton, canola and corn are the major biotech crops planted. Biotech disease-resistant papaya and squash are available. 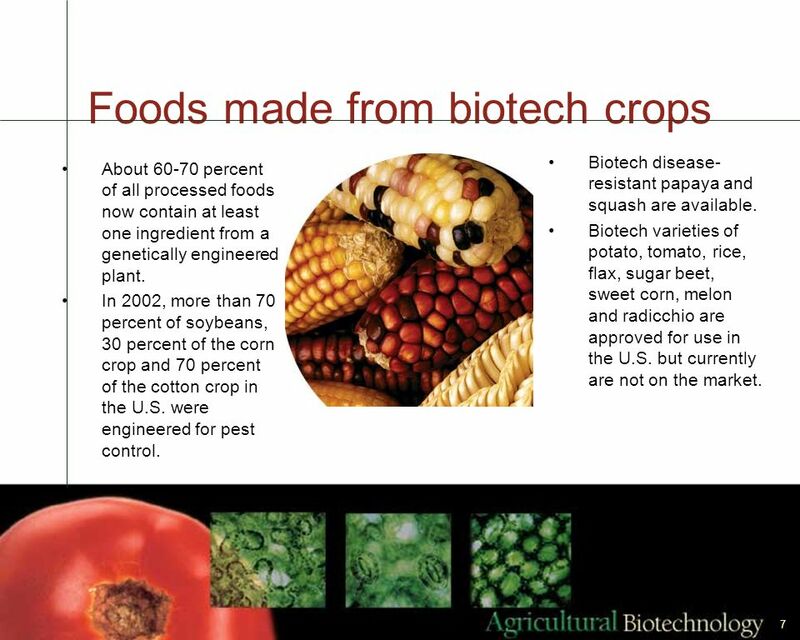 Biotech varieties of potato, tomato, rice, flax, sugar beet, sweet corn, melon and radicchio are approved for use in the U.S. but currently are not on the market. About percent of all processed foods now contain at least one ingredient from a genetically engineered plant. In 2002, more than 70 percent of soybeans, 30 percent of the corn crop and 70 percent of the cotton crop in the U.S. were engineered for pest control. 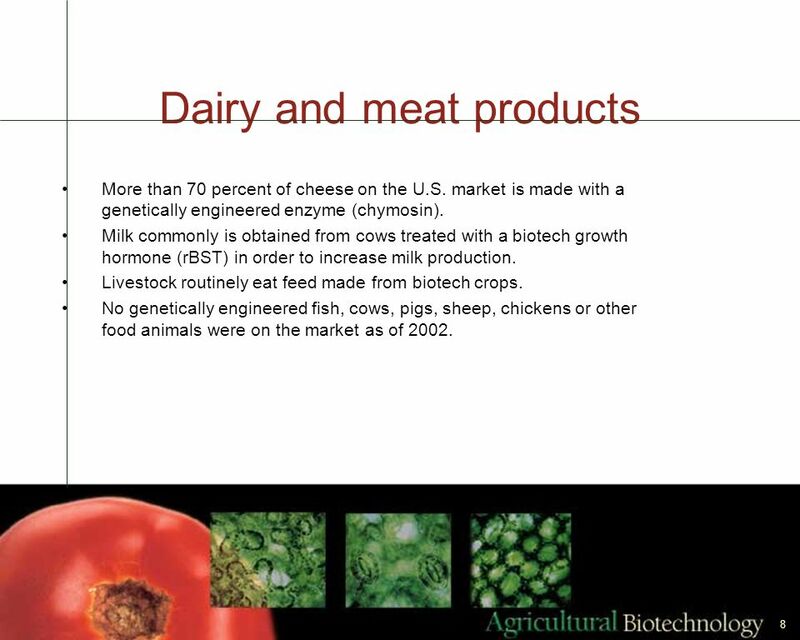 More than 70 percent of cheese on the U.S. market is made with a genetically engineered enzyme (chymosin). Milk commonly is obtained from cows treated with a biotech growth hormone (rBST) in order to increase milk production. Livestock routinely eat feed made from biotech crops. No genetically engineered fish, cows, pigs, sheep, chickens or other food animals were on the market as of 2002. 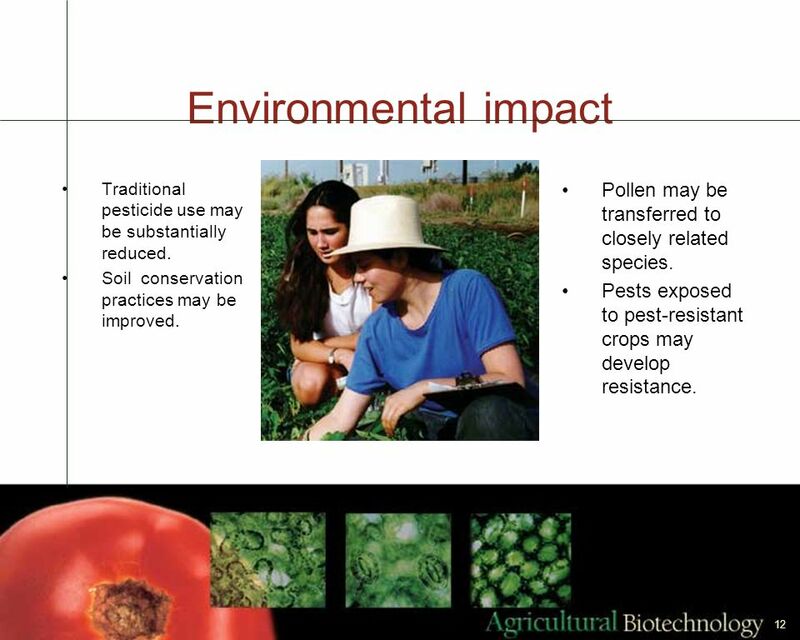 12 Environmental impact Traditional pesticide use may be substantially reduced. Soil conservation practices may be improved. Pollen may be transferred to closely related species. Pests exposed to pest-resistant crops may develop resistance. 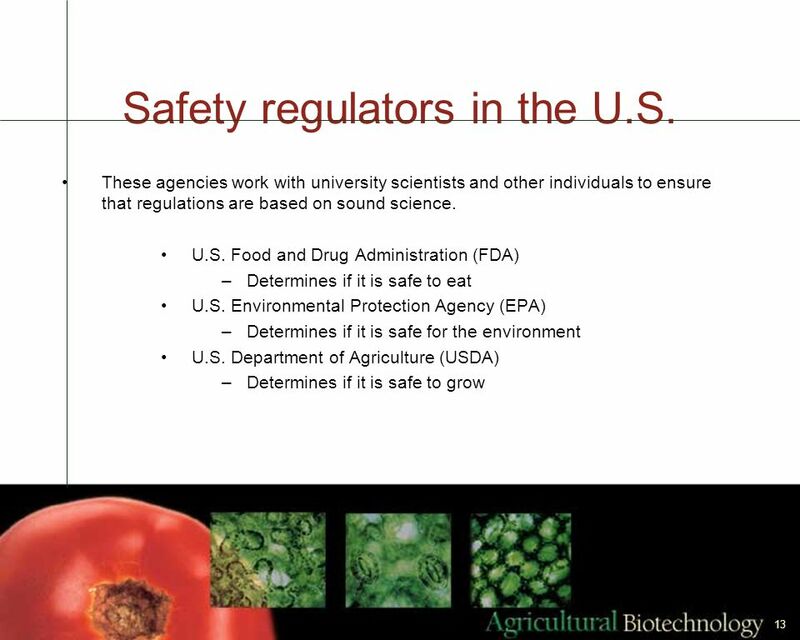 13 Safety regulators in the U.S.
14 Safety evidence All available evidence to date shows that foods from biotech crops are as safe as foods from non-biotech crops. The U.S. food supply is among the safest in the world. Reminder: No food is 100 percent safe. Contamination and spoilage remain the real safety issues. 15 Should we label? 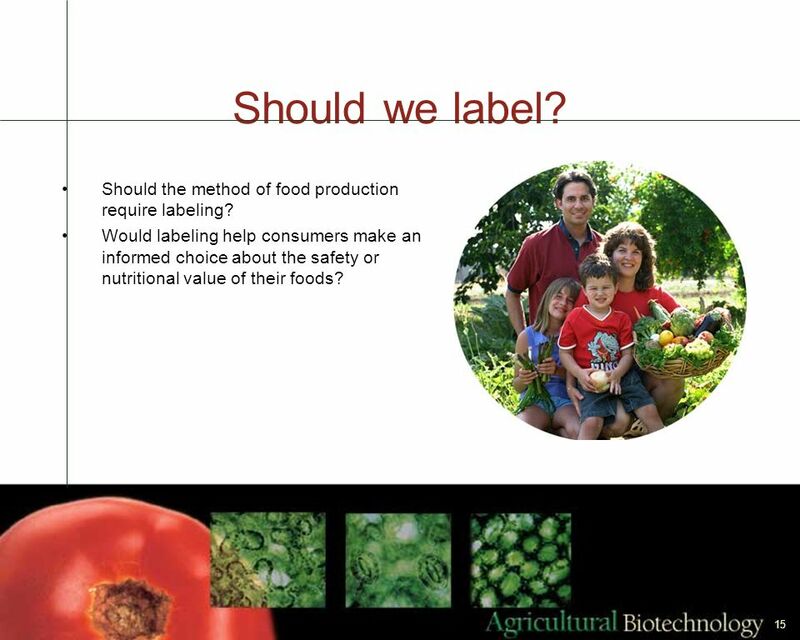 Should the method of food production require labeling? Would labeling help consumers make an informed choice about the safety or nutritional value of their foods? 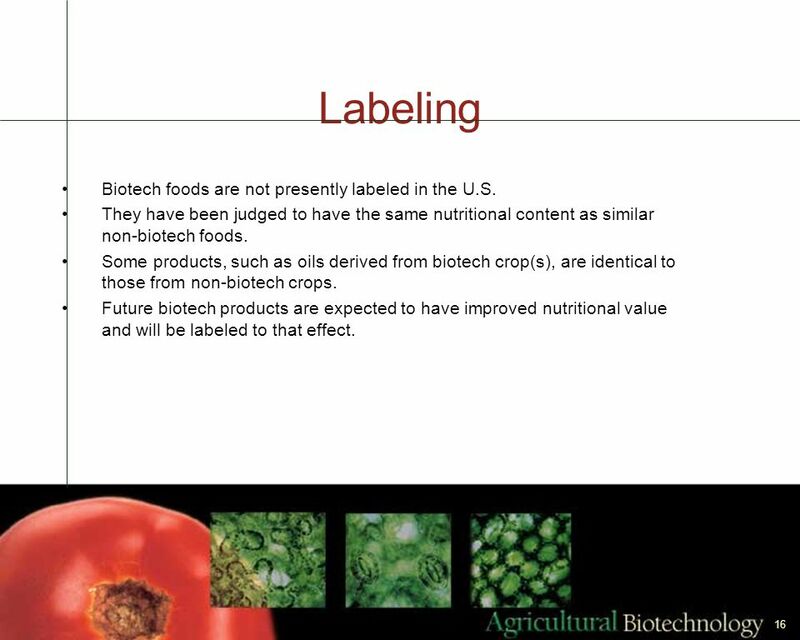 16 Labeling Biotech foods are not presently labeled in the U.S. They have been judged to have the same nutritional content as similar non-biotech foods. 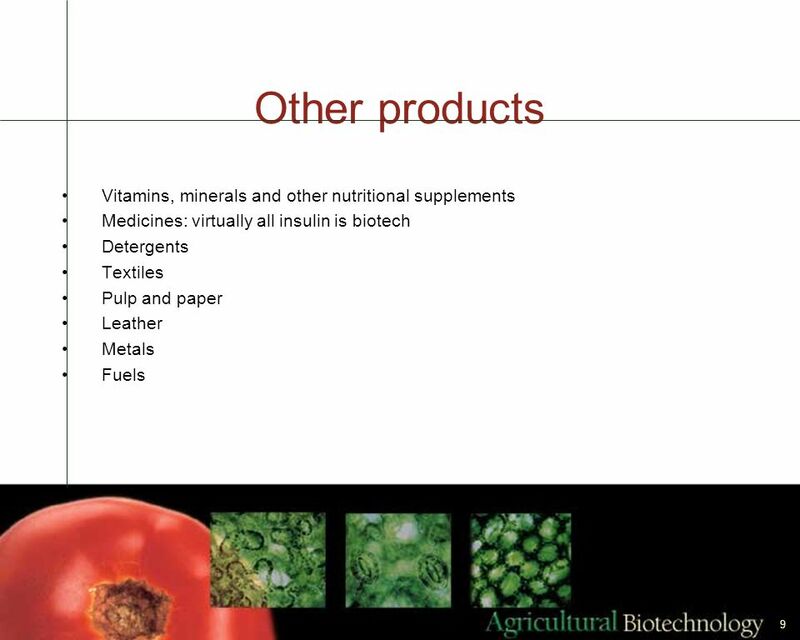 Some products, such as oils derived from biotech crop(s), are identical to those from non-biotech crops. 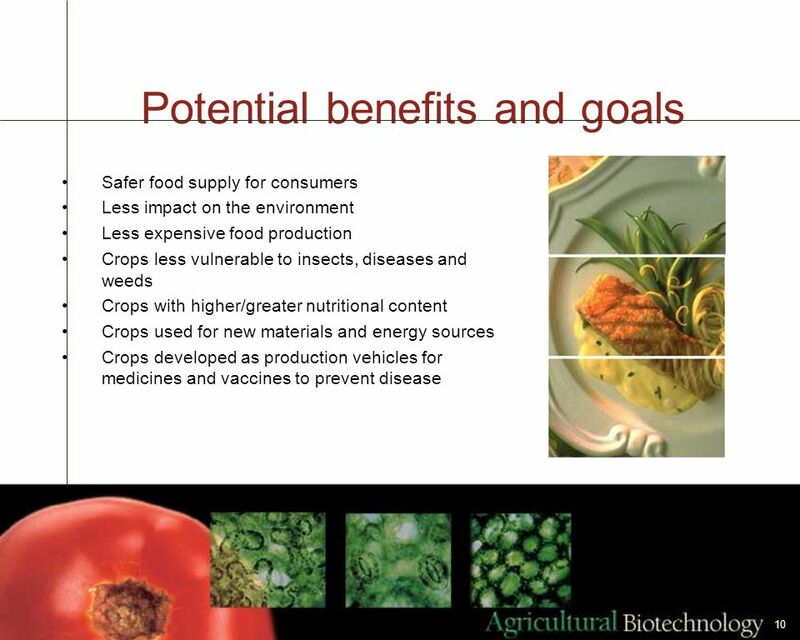 Future biotech products are expected to have improved nutritional value and will be labeled to that effect. 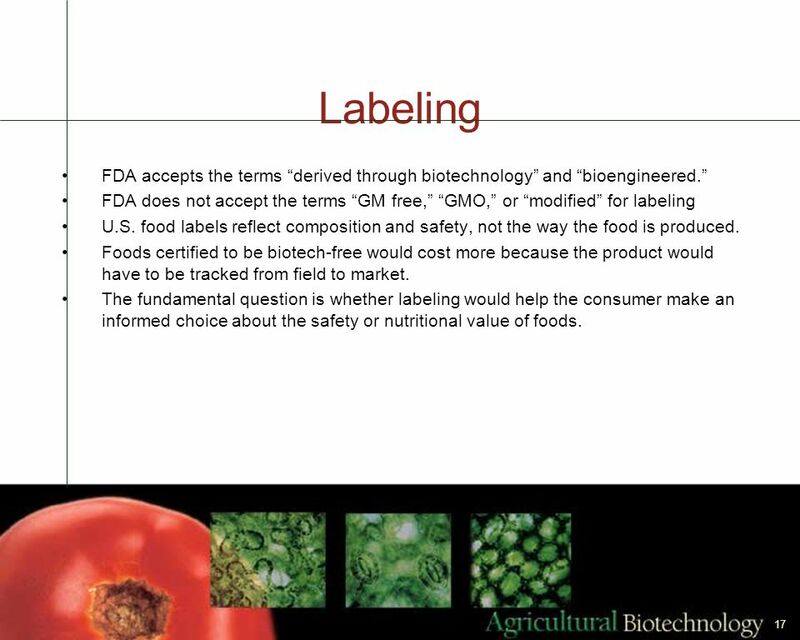 17 Labeling FDA accepts the terms “derived through biotechnology” and “bioengineered.” FDA does not accept the terms “GM free,” “GMO,” or “modified” for labeling U.S. food labels reflect composition and safety, not the way the food is produced. 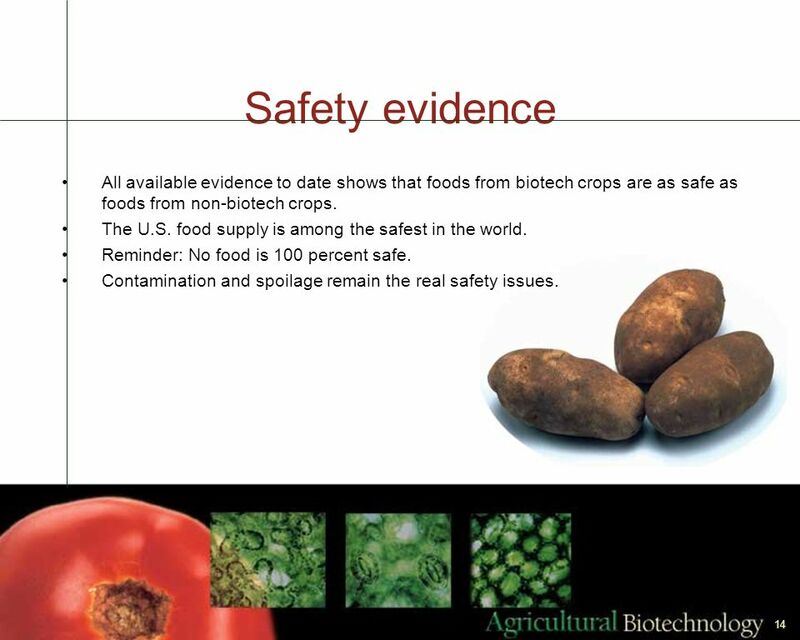 Foods certified to be biotech-free would cost more because the product would have to be tracked from field to market. The fundamental question is whether labeling would help the consumer make an informed choice about the safety or nutritional value of foods. 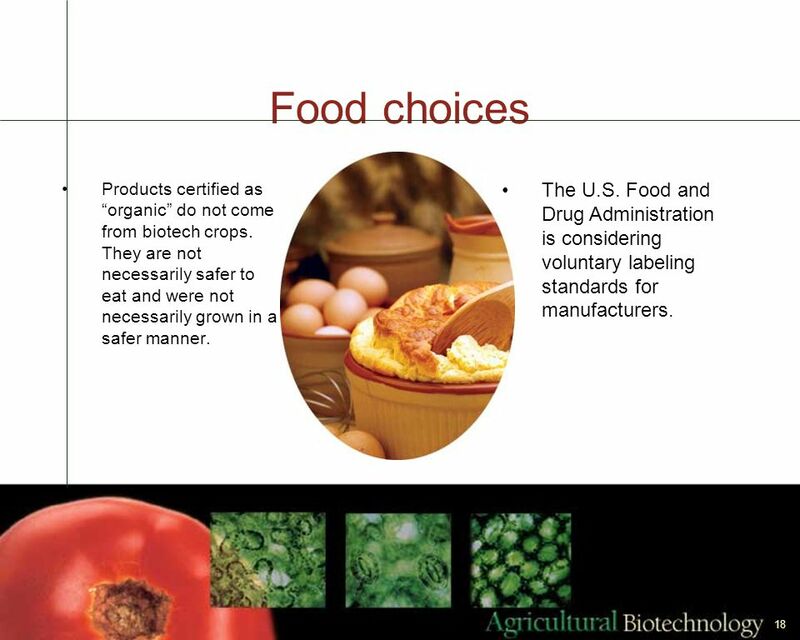 18 Food choices Products certified as “organic” do not come from biotech crops. They are not necessarily safer to eat and were not necessarily grown in a safer manner. The U.S. Food and Drug Administration is considering voluntary labeling standards for manufacturers. 19 Public involvement We need to produce a safe, sufficient food supply. We need to grow food in an environmentally responsible fashion. We must maintain factual and open public discourse on the impact of biotechnology on the world. Research conducted at land grant universities is critical to the evaluation process. 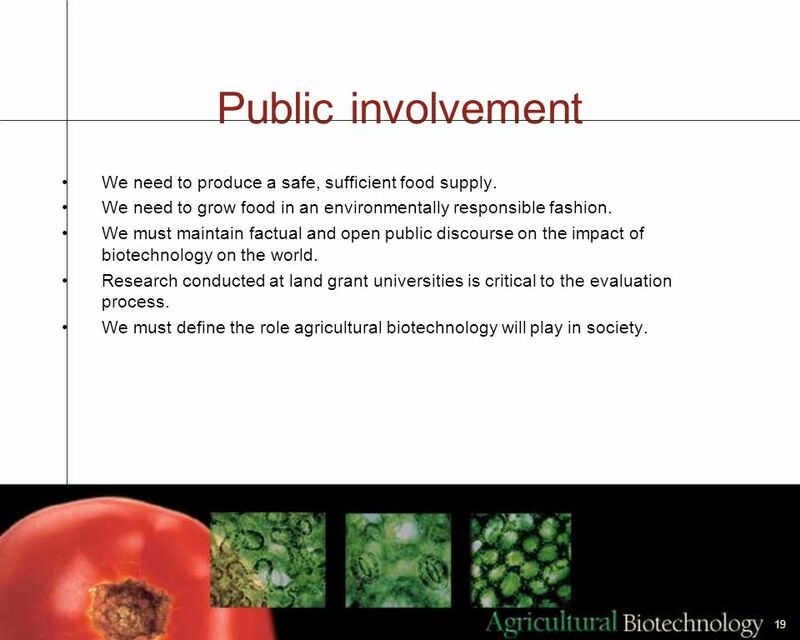 We must define the role agricultural biotechnology will play in society. Download ppt "What are the issues? 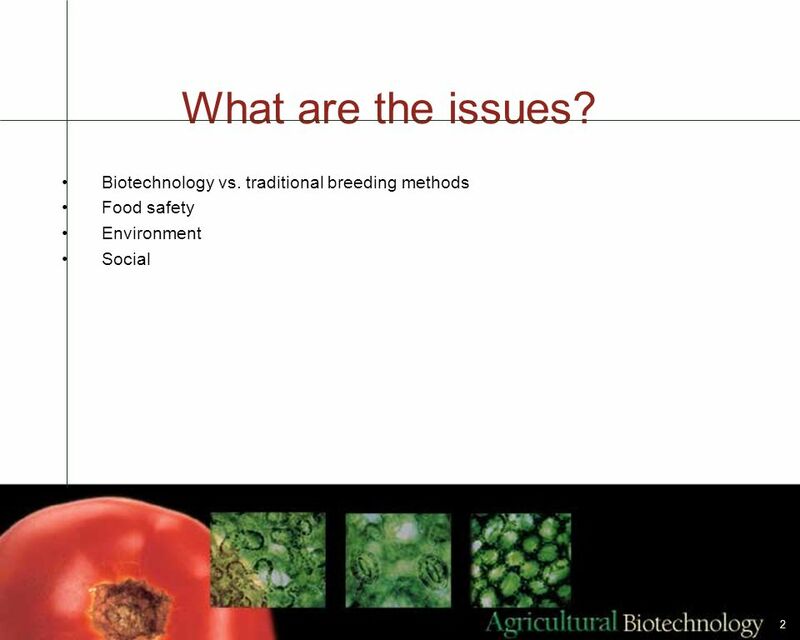 Biotechnology vs. traditional breeding methods"
Genetically Modified Organisms Emily Walls Zach Witherspoon. By Sean Merrett and Melissa Slingerland. are also known as genetically modified or GM crops A transgenic crop plant contains a gene or genes which have. 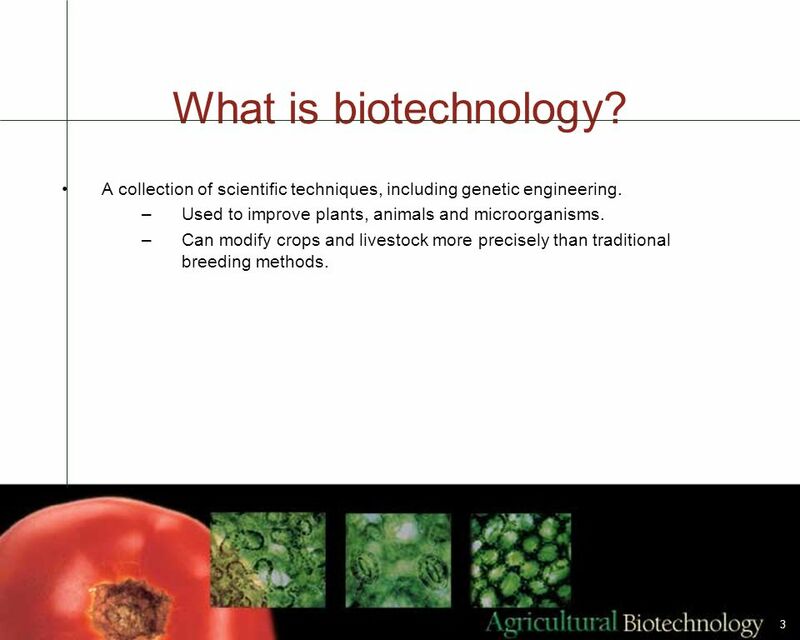 B REAKTHROUGHS I N B IOTECHNOLOGY 1.. Biotechnology The use of gene science to create new products from plants and animals. Agricultural Biotechnology Marshall A. Martin Professor and Associate Head Department of Agricultural Economics Purdue University March 2000. 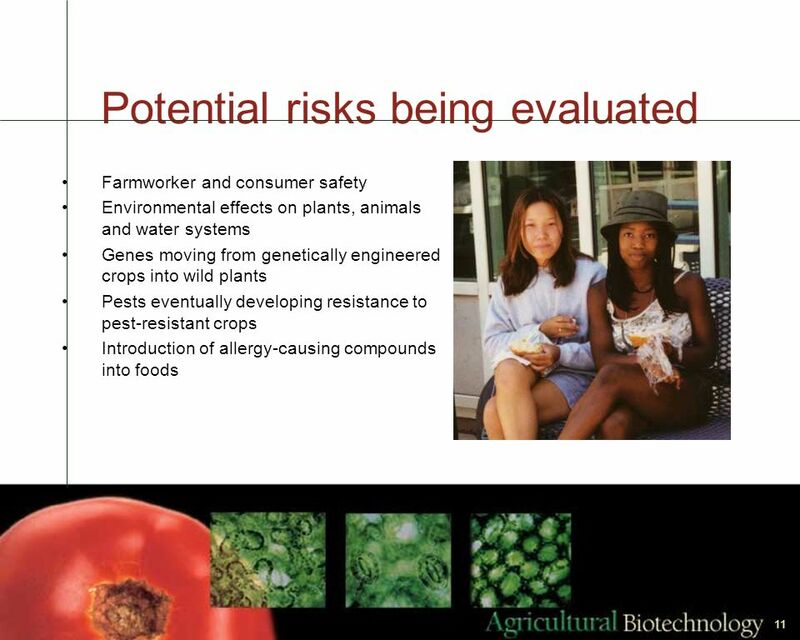 Future Food or Frankenfood Bio-technology and Genetically Modified Organisms. 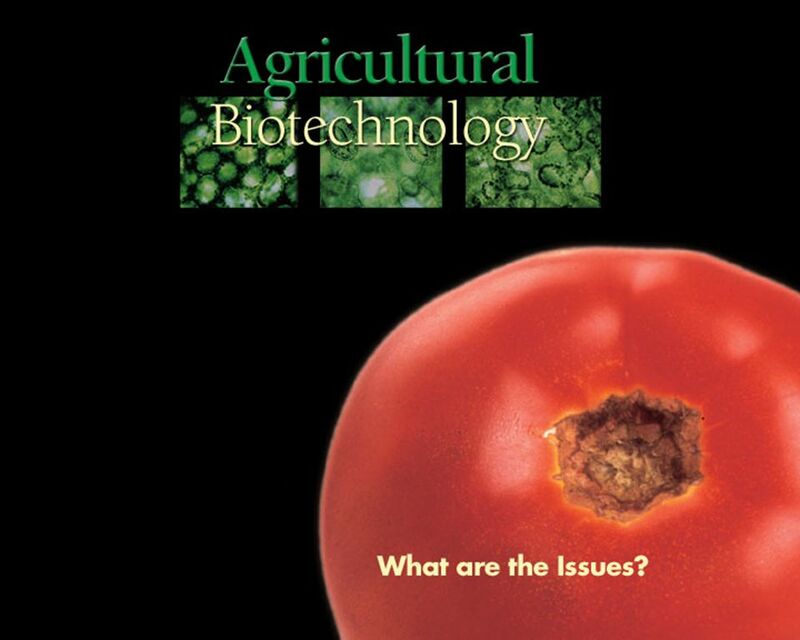 NDSU Agriculture TRENDS IN THE USE OF CROPS DEVELOPED THROUGH BIOTECHNOLOGY IN THE USA AND THE WORLD BY: Dr. Duane R. Berglund Professor of Plant Science.